Whether you call it Viscum album or Viscum cruciatum or Phoradendron leucarpum, if you put a red bow on it and hang it in the hallway chances are you’ll find people grabbing a kiss. Yep, we’re talking mistletoe here. Whether you’re in Great Britain or China or the United States, you can find some variety of the plant that’s considered parasitic and lives on trees. No matter. Once a year, mistletoe becomes a sought-after commodity. It can claim a place in a variety of cultures although why it became a kissing prompter is a little hazy. In Norse mythology, mistletoe is part of a murder story involving Loki, a shape shifting god in and out of alliances with the other Norse gods. Baldur, the god of Spring and light, was supposed to be protected from all of nature after his mother Frigga, goddess of beauty, love and marriage, asked each to protect him. She left out mistletoe since it was so young and harmless. Loki got another god to shoot an arrow made of mistletoe and Baldur died. Some stories say Frigga’s tears became the white berries on mistletoe. One version claims her tears and the berries brought Baldur back to life and mistletoe then became a symbol of love and peace. In that version those who stood under the mistletoe would be offered a kiss and protection. 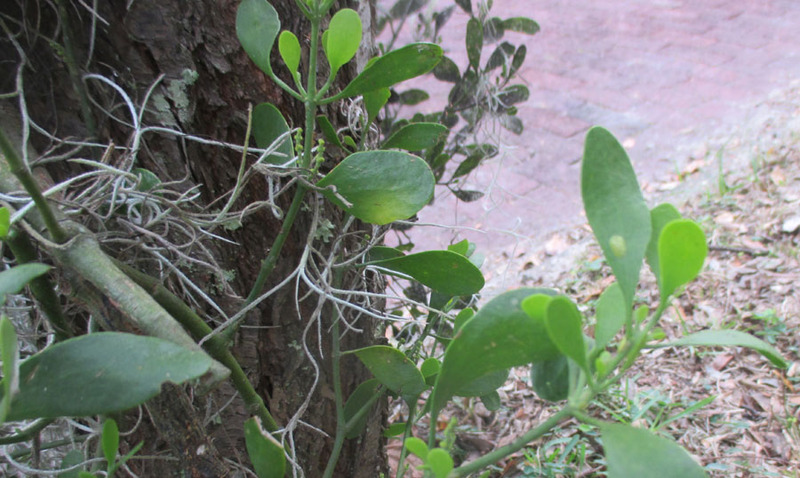 No matter what the culture or story mistletoe is noted around the world for curative powers. And sometimes nothing can be more curative than a kiss.